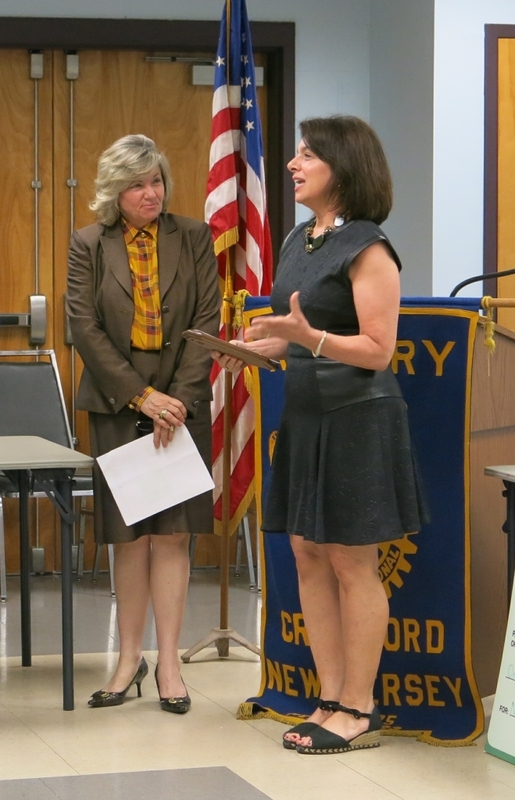 The Rotary Club of Cranford honored two outstanding members of the Cranford Community at a Rotary meeting on June 11. Cranford Police Lieutenant Chris Polito was given the Dr. Edward M. Coe Award and Cranford High School faculty member Barbara Narus received the Vincent Sarnowski Award. “Both individuals represent the very best of their chosen vocation” said Lou Brigando, Cranford Rotary’s Vocational Chair. “Lieutenant Polito is a 16-year veteran of the Cranford Police Department and has been the Executive Director of the Cranford P.A.L. for over 10 years. Lt. Polito has quietly changed the lives of thousands of young people in Cranford through sports” according to Chief James Wozniak who nominated Lt. Polito. The honorarium he received as part of the Edward Coe award will be donated to the Michael Wielgus Foundation. 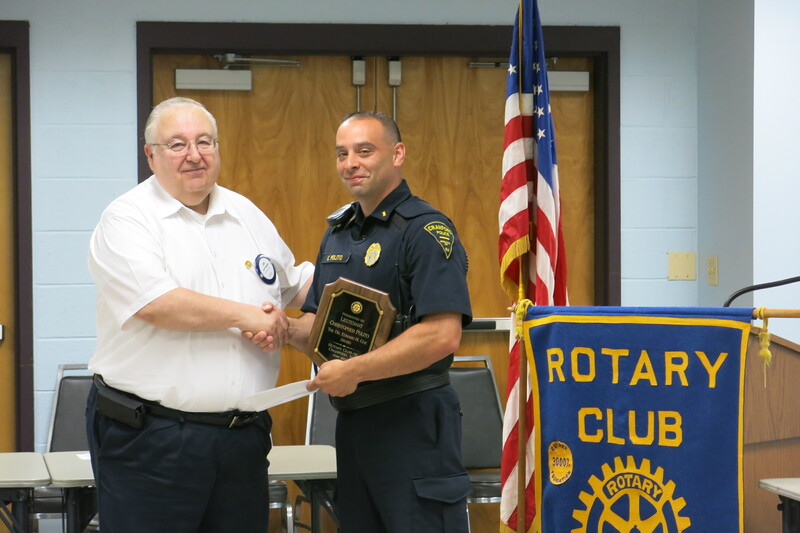 The Edward M. Coe Award is given to a member of the uniformed municipal services on a rotating basis, as suggested by the Cranford Rotary and recommendation of the appropriate Municipal Chief or other Cranford Official. Dr. Coe was a member of the Cranford Rotary from 1949 until his death in 1997. He was past President of the Rotary and a founding member of the Cranford First Aid Squad. School Superintendent and Rotarian Gayle Carrick presented Barbara Narus with the Vincent F. Sarnowski Award. Ms. Narus runs the Teacher Cadet Program and was nominated for the honor by Superintendent Carrick. Ms Narus has asked that the honorarium that is associated with the award go to the College Woman’s Club. The Vincent F. Sarnowski award is given to a Cranford Educator as recommended by the Cranford school system. Mr. Sarnowski was Superintendent of the Cranford Public Schools until 1973 and was a Past President of the Cranford Rotary Club. The Rotary Club of Cranford was established in 1923 and provides diverse programs that support education, and other community services. Past beneficiaries of Rotary support include Cranford Schools and Scholarship Recipients, Cranford First Aid Squad, Cranford Family Care, Cranford Cerebral Palsy League, Cranford United Way, Cranford Historical Society, Cranford PAL and the Rotary International Foundation. The Cranford Rotary Club meets every Thursday morning at 7:45 am at the Cranford Community Center. Any business or professional, active or retired, is cordially invited to attend our meeting. For additional information, please contact Membership Chair Rich Feder at 908-276-8086.